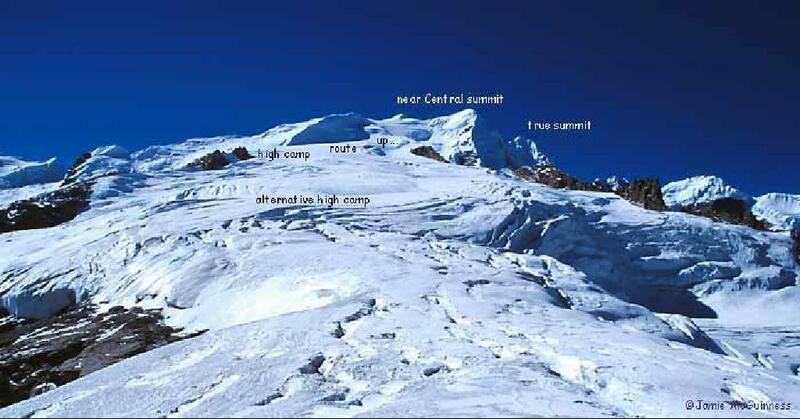 I climbed Mera Peak on a very cold morning in October 2006. From the time I finally bought this tour I only had 5 weeks to get all the needed gear and getting ready. I had no idea about the amount of time and the list of equipment nor did I know about the particular brands normally used for climbing and trekking mountains in Nepal. We first spent 2 days in Kathmandu before flying to Lukla. From Lukla everything was on foot, there are no cars, busses etc. in Lukla. Getting to the foot of the mountain took 10 grueling days of hard trekking through hell of mud, rain and rocks. It was hard, it was wet and it took a lot of sweating. Being in the mountains offered fantastic scenery and at the end it was good for acclimatization to higher altitudes. We were 8 on this tour/expedtion and 2 persons had to stay at 5000 meters in Khare due to altitude sickness, but the rest of us continued to the top. Khare was our Base Camp, actually our tents were apx. 150 meters higher than Khare and from there we we went to Mera La at 5350 and on the last day we went to our high camp at 5805 meters. It took us only 2 hours and 15 minutes to go from Mera La to high camp and from there, the same night we went for the summit. We intentionally wanted to leave for the summit at 01:00 after midnight, but due to bad weather this was postponed to 03:00 (and thank God for that) becuase we did it in 3.5 hours, and came just in time to enjoy the sunrise together with us. The best part of the tour was to see and experience the sunrise over the mountains as we were climbing the summit. When we were aproaching the top we could clearly see that the sun was illuminating the peaks around us. Due to the curvateur the highest points is hit by sunlight the first and it was beautiful to see the sunlight illuminating the highest mountains as we were still walking towards the top in the dark, and then slowly more and more of the mountain is hit by the sun. We passed a canadian/brittish team on our way to the top and could enjoy the top, before descending to high camp and then all the way back to Khare which we reached at 14:30. On the way back to Lukla we faced hell of snow as we walked up and down mountains for one full day from 08:00 till 18:00 while it was snowing. 1 - Your first appearance, he said to me, is the gauge by which you will be measured; try to manage that you may go beyond yourself in after times, but beware of ever doing less. 2 - You know that children are growing up when they start asking questions that have answers. 3 - The solution is to gradually become free of societal rewards and learn how to substitute for them rewards that are under one's own powers. This is not to say that we should abandon every goal endorsed by society; rather, it means that, in addition to or instead of the goals others use to bribe us with, we develop a set of our own. 4 - Keep away from people who try to belittle your ambitions. Small people always do that, but the really great make you feel that you, too, can become great. 5 - Very efficiently written post. It will be valuable to anyone who usess it, as well as myself. Keep doing what you are doing i will definitely read more posts. 6 - In my friend's web blogs they already have provided me on the website rolls, but mine usually is located at the bottom on the listing and does not selection when I place as it does for some individuals. Is this a placing that I have to difference or is this a choice they may have considered? . 7 - Keep working ,impressive job! 8 - Very energetic blog, I enjoyed that a lot. Perhaps there is a part 2? 10 - Its like you read my mind! You seem to know so much about this, like you wrote the book in it or something. I think that you could do with a few pics to drive the message home a little bit, but other than that, this is great blog. An excellent read. I will certainly be back. 11 - I will immediately clutch your rss feed as I can not to find your email subscription link or enewsletter service. Do you have any? Please let me know in order that I may just subscribe. Thanks. 13 - I will immediately grab your rss feed as I can not find your email subscription link or enewsletter service. Do you have any? Kindly let me know so that I could subscribe. Thanks. 14 - Actually its referred to as Search engine optimization that when i search for this post I found this web page at the top of all web pages in search engine.